When you are traveling, your option does not have to only be hotels. 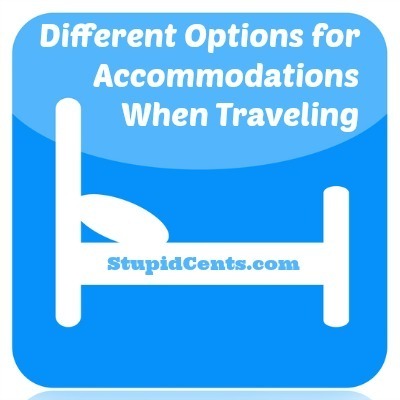 There are many other places for where you can sleep each night, and you can probably even save more money staying somewhere else besides a hotel. This is the most obvious reason. A hotel can be nice because there is probably food inside the hotel, and you are probably located next to something touristy. There are many people who work at hotels who are there to help make your trip more enjoyable, which can make a vacation much easier. A rental home such as using VRBO.com or Airbnb can mean that you are staying more like a “local.” You might be able to learn the area better, and staying long-term is usually more cost-effective in a rental home instead of a hotel. A rental house has many positives. If you are traveling with many people, then the cost-per-person for the rental will probably be very low and of great value. You can also cook your own meals in a rental home, which will save you further money. Also, if you have dogs, then you might be able to bring them for an additional fee. There are many positives of staying in a hostel. If you are traveling alone, then usually hostels are your cheaper option. You can usually stay in a single room with an unattached bathroom, or a dormitory room with bunk beds for even cheaper. If you are traveling with another person, then staying in a hostel may not always be your cheapest bet as you usually pay per person. Some hostels have a party atmosphere, whereas some do not. You should research reviews before making your decision. Hostels can be a great way to meet new people, and you don’t want to stay in your room 24/7 anyways, right? If you already have the equipment, then camping will most likely be very cheap for you. You may have to pay a fee to camp at a park, but usually it is much cheaper than actually having to pay for a hotel. Renting or buying a recreational vehicle may have a large upfront cost, but sometimes it may be more efficient for a long-term trip, or if you plan on doing many shorter trips over your lifetime. You won’t ever have to pay for a hotel, and you might even be able to use the bathroom or shower inside your RV. All of this can make visiting the outdoors much more easier. There are many websites today that allow you to find a house to sit. Most of these websites are hard to get onto, as most home owners will want someone with a lot of reviews under their belt. You never know, you might be able to find a castle in Europe to house sit! Where do you prefer to stay when you are traveling? VRBO is a great source for short term rentals, even less than a week, world wide. We have used them for 20 years both in US and Europe. Especially great if you are traveling with a child, how we started using them. You can cook, live in a REAL neighborhood, get a much better feel for an area and save tons not just on room but on food and laundry ( pack lighter and do laundry).